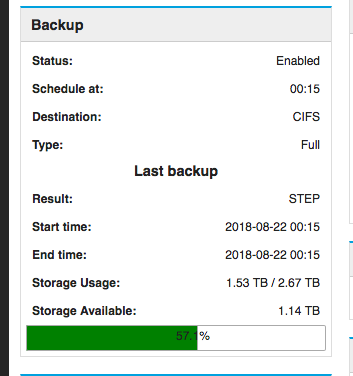 Can’t understand why even I configured the Backup-Data to FULL Backup , yet I still seeing the Backup as STEP as end of each day. I try restarting the Server, it makes no difference. You have it set to do 1 full and the rest incremental? The strange part is that the Configuration as shown is FULL Backup yet… it does a STEP Backup ( Partial ) and then after a few days…it stop backing up totally. See Screen shot. Step means, that the backup routine is still running. Is has certain steps. In my experience, I had some trouble with CIFS as the connection is open for quite a long time and a lot of data is transfered. I suggest to try something else besides CIFS: Do you have an USB-disk for trail purpose?